When going back to college, tips can be a lifesaver. Get the advice you need to navigate financial aid, prepare for success, and build the career you want. Keep up-to-date with the latest advice from Finish College. Almost done! Please check your email to confirm subscription. Ready to Go Back to College? Our Ebook will help you take the first steps! 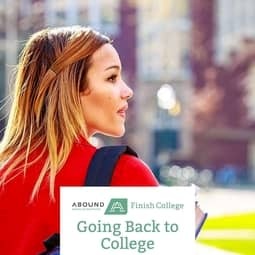 Join our mailing list to receive a free copy of "Going Back to College", the new ebook from Abound: Finish College!